Don’t tell anyone, but my favorite week to work is btwn xmas and nye. Sure, it’s better to have it off. But everyone is relaxed, there’s just a few last minute end of year things to do, and most of the PMs have vacation time that they HAVE to take before the end of the year or they’ll lose it forever. So, here’s my month-by-month year in review. Some of this is on the webpage, some isn’t for no other reason than I just never got around to posting it. January Start using wordpress on this here page. Still working on thesis, last minute reviews taking a very long time. Go for a week visit at gramma’s house. February Sort of officially finish thesis. Still working on campus. Begin short-lived reviews of PGH fish sandwiches. Write a crafty book review of a crafty book. Crafty retreat in catskills, followed by nearly crashing my car. If by nearly you mean bouncing it off of a tractor trailer wheel while everyone proceeds down the highway at 80 mph. Begin “things on crackers” diet. Get job offer for CurrentJob, after a really fun and satisfying phone interview. Begin salary and vacation negotiations, which are very scary, but very important. March Accept CurrentJob. Begin obsessive research about n. nj and her library system. Try to find an apartment in a blizzard, and decide instead to be homeless for a month while I find a place to live. And by homeless, I mean, crash at the beau’s. Break up with Pittsburgh and with Michelle. Discover that I am contaminated with little to no mercury. Start new job. Am walked in on in the shower while living with 500 boys at the beau’s. April Try to determine best way to deal with infestation of dirty dishes. Learn how to inject molasses into the ground. Get an apartment, a work laptop, and a birthday all on the same weekend. Obsess about driving to work, but determine that contrary to all rumors, NJ is actually very pretty in the spring. Go to the Netherlands. Return, find a CSA. May Marathon weekend of moving from Pittsburgh. Paint living room and kitchen, nearly develop rotator cuff injury, promptly run out of steam. Return to PGH to officially graduate. Get a digicam. Join a gym. Flip out at predatory lending credit union who is taking advantage of my baby brother. Mommy’s lump is a non-issue, and Daddy goes to hospital after walking around with chest pains for a week. Marathon trip to PGH to help Michelle move, via Albany to visit the dadster. June Frantically sew dress. Wear it to Paulina’s wedding in Miami. Dadster remains in hospital for 2 weeks, getting home in time for father’s day. Go to renn fair with Fabulous Matt M. to see Fabulous Gabulon. Put name on list for honda civic hybrid. Begin obsessive research about new technologies involved. Start CSA season, and also, start really truly trying to eat all of those darn vegetables. Make Tang Pie. Attend Ron and Caroline’s wedding. July Buy paint for hall and bedroom. Put it down, and don’t pick it up again for quite some time. Lose my voice. Begin summer of guacamole and mojitos (not related to each other, or to the lost voice). 3-D birthday party in albany. Learn to make green curry. Drive to western NY to pick up diesel camper van Wayne with superhero brother and sidekick nephew. Begin period of crushing self doubt at work. August Add weekly 3+ hour PE review course (located up to 2 hrs away from work) to my crushing slate of activities and responsibilities. Go on vacation at Assateague. Come back. Experience sensation at work quite like a house of cards falling about my ears. Continue period of crushing self doubt at work, see also, addition of only negative feedback received into professional life. Finalize thesis, for real, this time. Find out new civic will only be CVT, not manual transmission. September Become livid and sorrowful about poverty and structural violence in our country. Sew another dress, wear to Brian and Lynn’s wedding. Start to lose battle against the mountain of vegetables, but continue to give it best shot. Continue work and PE review course, crushing self-doubts, negative feedback. Begin reading productivity books. Also begin secretly planning to get an insight instead of a civic. October Discover phenomenal bloody mary’s at crab house in edgewater. Buy an MP3 player. Read an excessive number of comfortable books. have a glimmer of positive thinking, but still feel overwhelmed at work. Am accepted to present in an as yet still upcoming professional conference. Move to new office space in Edison. Cram cram cram for PE, take it, feel very vague and ambivalent and that at least it’s over, and I can’t do a thing about it for another 4 months+. November Go to PGH for mariss’ 30th birthday. Begin getting professional help for blueness issues, including also relationship things. Surreal anniversary with the best gift ever for matt. Crafty retreat with girlfriends! Fog over professional life begins to lift. Paint hallway (finally!). Order insight! Begin obsessive research about insight, tax deductions, etc. Discover my ACL is totally missing, schedule surgery for ASAP. December Have surgery. Go to dad’s house to recover, come back, watch DVDs constantly, begin to feel like a shut in. Arm wrestle with honda dealer to get a car in a timely fashion. Get internets at home. Return to work, start physical therapy, become very emotional. Wayne gets too cold to move, have him towed to a brilliant diesel mechanic one town south. Office holiday party. Attempt to attend PGH holiday party, but am stranded in Somerset PA over the weekend. Winter solstice, aka, shortest and darkest day of the year: “it’s all brighter and better after this!” Pick up new car! Xmas in Albany, DanAaron , winning best brother of the year award foshizzle, drives Wayne home to live behind the barn for the winter. Fog begins to lift over personal life as well. mourn flo as I arrange to donate her to charity. And that brings us to today. 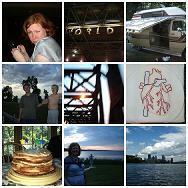 This year was tulmultuous, busy, crazed, and full of life changes. I am exhausted just compiling that list! I have to quit the internets for a while and get some coffee and chocolate to recover. A whole New Year full of Beans. no wonder you are going through such emotions, your year has been one huge upheaval after another, and now you need to rest and know that we who love you know how capable you really are. hang in there, the sun is returning!